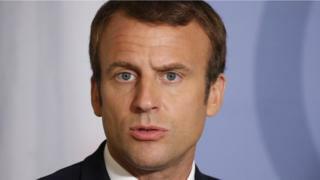 President Emmanuel Macron's government has begun its drive to overhaul France's rigid labour laws, vowing to "free up the energy of the workforce". The reforms aim to make it easier for bosses to hire and fire. Prime Minister Edouard Philippe said they were ambitious, balanced and fair but it was natural that not everyone would support the changes. Protests against the plan are expected next month, but two of the biggest unions say they will not take part. Jean-Claude Mailly, the leader of Force Ouvrière (FO), said that while the reforms were far from perfect, the government had carried out "real consultation" and FO would play no role in demonstrations on 12 September. The union with the biggest presence in the private sector, CFDT, said its members would not take to the streets either, although it was ultimately disappointed that its position was not reflected in the final text. Further protests are promised on 23 September by far-left leader Jean-Luc Mélenchon, who is expected to spearhead opposition to the reforms. What does Macron want to do? France has an unemployment rate of 9.5%, double that of the other big European economies and Mr Macron has vowed to cut it to 7% by 2022. France's labour code is some 3,000 pages long and is seen by many as a straitjacket for business. Among the biggest reforms, individual firms are to be offered more flexibility in negotiating wages and conditions. Labour Minister Muriel Pénicaud said 36 new measures would be aimed at promoting "social dialogue". If a business reached a deal with the majority of its workforce on working hours and pay that agreement would trump any agreement in the wider industry. Over half of French workers are employed by small or medium-sized businesses. The government wants to facilitate deals at local level by encouraging companies with fewer than 50 employees to set up workers' committees that can bypass unions. One of the thorniest problems for the government is how to make it easier for companies to dismiss staff. There is to be a cap on damages that can be awarded to workers for unfair dismissal. However, after months of consultations, ministers have agreed to increase the cap from their original proposal. The cap would be limited to three months' pay for two years of work and 20 months' pay for 30 years. Until now the minimum pay-out for two years' employment was six months of salary. In contrast, normal severance pay will increase. He has a far greater chance than anyone before him. François Hollande's Socialist government watered down plans to reform the labour code in the face of street protests. However, Mr Macron has already won parliamentary backing to push these reforms through by decree. An opinion poll on Wednesday showed that nine out of 10 French people agreed that their country's labour code had to be reformed, although 60% were worried about the Macron plan. Will France take to the streets? There were plenty of warnings that Emmanuel Macron would face a "hot autumn" of strikes once the detail of his labour reforms were released. The reality is likely to be less dramatic. Yes, the unions are unhappy but some are more unhappy than others. Of the three big federations, only the CGT is calling for protests on September 12. Two points set these reforms apart from previous botched efforts to change the labour code. Even the most hostile union leaders concede that the government's method has been impeccable. There were proper negotiations, and there was give and take. But more important, the democratic legitimacy behind the Macron plan is unarguable. Nothing in the plan is a surprise. Everything had been announced ahead of his election. Mobilising the country to stop what it has just voted for was never going to be an easy sell. The president knows the challenge he faces in winning over the electorate and he says he is expecting months of resistance to the proposals. France was "the only big EU economy that hasn't combated mass unemployment for more than three decades", he said in an interview on Wednesday, adding that the biggest victims were the young and the unskilled. Mr Macron has seen his popularity slide dramatically since he came to power on 7 May. A poll on 27 August suggested his approval ratings had fallen from 57% in July to 40%. Last week, on a visit to Romania, he complained that France was not a "reformable country... because French men and women hate reform". He quickly went on to explain that what France needed was "transformation" rather than reform.